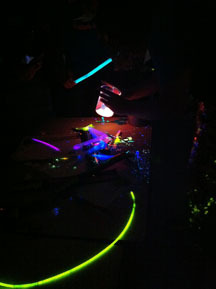 Halstead High School ChemClub members serve up a smorgasbord of luminescent glow stick experiments. The Halstead High School ChemClub in Halstead, Kansas, recently decided to partake of the collection of glow stick experiments posted on the ACS ChemClub’s September Activity of the Month page “Lightsticks and Luminescence.” We did several experiments from the Activity of the Month links, but did others as well. Our experiments included snapping wintergreen mints in the dark with various objects so we could see the spark they emitted. We also used a black light to see what kinds of colors fluoresced. Several students tried the Mountain Dew and hydrogen peroxide experiment shown in a video that has been traveling around the internet. They confirmed that it is a hoax and does not work like the video claims. Lastly, and a clear favorite of the students, we cut open glow sticks and mixed the colors to see what combinations we could create. While cutting the glow sticks open was a bit messy, the students had a lot of fun mixing the colors and were glowing in both appearance and excitement at the end of the experiments.